Sources praise his experience as a former member of the DOJ, and comment that he is "very effective in court." He is considered "the complete package." A seasoned litigator, George Stamboulidis has tried dozens of complex federal jury trials as a prosecutor and as a defense attorney. Recognized for his experience in the areas of white collar and business defense, George is regularly engaged by corporations, directors and officers to advise and defend in complex federal grand jury and regulatory investigations. He counsels and successfully represents Fortune 100 companies on FCPA issues, including conducting reviews to make best practice policy enhancements to corporate compliance policies, revise and optimize corporate training programs, and conduct testing to ensure that the policy enhancements are followed. He also routinely advises on enhanced due diligence. George is trusted for his integrity and sound judgment in corporate monitorship positions. He has been appointed a federal monitor five times by the U.S. Department of Justice (DOJ). 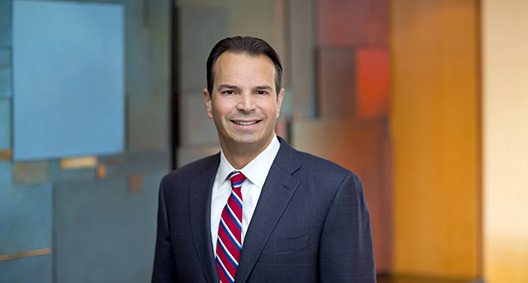 George is Managing Partner of BakerHostetler’s New York office and co-leader of BakerHostetler’s national White Collar, Investigations and Securities Enforcement and Litigation practice, which is ranked in Chambers USA: America’s Leading Lawyers for Business. He is a nationally recognized lecturer on corporate criminal liability and the use of proactive defense tactics, and he regularly presents to members of the financial services, insurance, pharmaceutical, energy, construction and real estate industries, among others. Secured complete dismissal of all charges against the CEO of a half-billion-dollar nationwide commercial real estate conglomerate charged in a 73-count fraud and money laundering indictment. Unwavering commitment to establishing the client's innocence resulted in the filing of a compelling pretrial dismissal motion, which established that the indictment was obtained through a defective grand jury process. As part of a multipronged defense strategy, following the pretrial hearing, the entire indictment was dismissed by the court. Obtained full dismissal of a multicount felony indictment against the president of one of New York City's largest HVAC contractors. Used extensive knowledge of the New York construction industry to persuade prosecutors that the client was not the proper target of a wide-ranging criminal investigation into corrupt billing practices of general contractors, who exploited subcontractors to overcharge high-end construction clients. Obtained a federal jury victory for the defense in alleged antitrust price-fixing in the auto parts market. Represented a corporate entity in a trademark infringement case in which a competing brand filed a lawsuit seeking an injunction barring the client from using four logos on licensed goods. Worked to level the playing field for the client during the trial, which resulted in a jury unanimously finding that three of the four trademarks adopted by the client did not infringe on the opposition's trademark rights. As part of its investigation into the collapse of Enron, was selected by the DOJ to serve as the outside independent monitor of Merrill Lynch, at the time the largest firm in the world by capital. Leading a team of attorneys and auditors, reviewed Merrill Lynch's implementation of policies and procedures governing the integrity of complex structured finance transactions and, in close consultation with both senior management, the Board of Directors and the DOJ, made recommendations to optimize policies, controls and training firm wide. Was the principal responsible for BakerHostetler's engagement in its DOJ appointment to serve as Independent Examiner of the Bank of New York. Led a team of attorneys and forensic auditors in monitoring the bank's suspicious activity, reporting practices and anti-money-laundering procedures, as well as its compliance with related laws and regulations. In addition to the bank, reported directly to the United States Attorneys' Offices for the Southern and Eastern Districts of New York, the Federal Reserve Bank of New York and the New York State Banking Department. Serves as court-appointed counsel to the Securities Investor Protection Act Trustee for the liquidation of Bernard L. Madoff Investment Securities LLC. Served as the outside independent monitor of Mellon Bank N.A. for the United States Attorney's Office. Led a team responsible for the oversight of Mellon's compliance with the terms and conditions of a settlement agreement with the U.S. Attorney's Office. This monitorship continued after Mellon's subsequent merger with the Bank of New York. As the former prosecutor who convicted corrupt politicians exercising improper influence on the operations of the Town of Brookhaven in Suffolk County, New York, was selected, after going into private practice, by the town board to investigate the operation of Brookhaven's landfill, and continues to serve as the monitor for the Town of Brookhaven's Waste Management Department. Reviews applications for access to the landfill, and approves haulers and vendors to mitigate the risk of corruption or illegal dumping and to prevent fraud. In an effort to eradicate organized crime's decades-long infiltration and control of Local 14-14B of the International Union of Operating Engineers, was appointed by the U.S. District Court for the Eastern District of New York to serve as the Ethical Practices Attorney for the union. Investigates allegations of misconduct by union officers, members and employers; commences disciplinary actions to eliminate corruption and the influence of organized crime from the union; reviews and revises job referrals and other union protocols; and supervises voting procedures and elections for union officers. As monitor of one of the world's largest engineering and electronics conglomerates, led a team that provided an independent report to the New York State Comptroller's Office regarding the corporation's internal controls with regard to compliance, government contracting and procurement systems. The team provided reports and recommendations for action after conducting interviews and testing systems of the organization's medical business. Selected as the new lead prosecutor in United States v. Wen Ho Lee, involving the mishandling of U.S. classified nuclear weapons secrets. Case was resolved in September 2000 with a felony guilty plea and the defendant’s cooperation. Prosecuted a public corruption trial of the most powerful political leader in Suffolk County, New York. Tried and won a conviction in United States v. Vincent “the Chin” Gigante (Genovese crime family boss). Tried and convicted the boss of the Colombo crime family. Convicted the underboss of the Lucchese crime family. Three-time recipient of the DOJ Director’s Award for Superior Performance.